The Dominican Republic’s national basketball team arrived in Kentucky yesterday before they start their training camp on Sunday. The team from the Dominican Republic is training in Lexington per request of their coach, John Calipari. While most of the college basketball world’s interest in the Kentucky Legends team that is being assembled and will feature many recent NBA stars who recently played for the Wildcats, we are more interested in the Dominican Republic team that has Al Horford (Florida) and Edgar Sosa (Louisville) on it staying in Lexington for at least 2 weeks (the game against the UK Legends is on August 15th) with the, um, crazed Wildcat fans around them. If ESPN or any network decided to follow this team while they were in Lexington we would definitely tune in. UNLV‘s hiring of Dave Rice was widely praised as a sign that the program was headed in the right direction, but don’t count Runnin’ Rebel legend Larry Johnson in that group. The 1991 National Player of the Year has come out recently and been very critical of the program and the direction it has taken under an administration that is headed by Jim Livengood, who came from Arizona, which has led Johnson to say, “It’s not UNLV Runnin’ Rebels no more, it’s UNLV Wildcats right now.” Johnson concedes that former coach Lon Kruger had made some attempts to bring some of the former UNLV players back into the program. When Kruger left Johnson put his name in for consideration, but was reportedly not even contacted by the current administration. While Johnson does not have any coaching experience that we are aware of and his name probably doesn’t carry a lot of weight with players who are entering college or younger, it is pretty clear that the UNLV administration made a mistake here by not even reaching out to Johnson even if it was only for show. Given UNLV’s recent efforts to land local recruits having someone of Johnson’s reputation on their side would be a major pull even if it was only the AAU and high school coaches who knew how good “Grandmama” used to be. After arriving at Maryland head coach Mark Turgeon talked openly about installing a 4-guard offense. That task and creation of a rotation to make the feasible became harder earlier this week when rising sophomore Haukur Palsson announced that he was heading back to Europe to play professionally. Normally the loss of a player who averaged 2.8 points and 2.1 rebounds per game would be relatively minor, but with Palsson’s ability to play inside and outside he would have been an ideal player to use in the rotation as a guard who could also battle underneath for rebounds. With Palsson gone the Terrapins only have eight scholarship players and fitting them into an unconventional offense could be a big challenge for the new head coach. When we first saw the headline mentioning that Jabari Parker, one of the stars of the class of 2013, was seriously considering BYU we brushed it off as just more ridiculous Internet speculation until we remembered that Parker is a member of the LDS Church. While BYU has had its share of star players they very rarely land a major recruit (Danny Ainge is the only even close to Parker’s level that I can think of). The hype on Parker is already getting to ridiculous levels (Mike Krzyzewski has compared him to Kobe Bryant and Grant Hill and Seth Davis has already written a feature story on him for Sports Illustrated), but don’t think that just because Parker is a member of the LDS Church he will be a guaranteed commit to BYU. Our older members will remember that when 1997 Sporting News National Player of the Year Chris Burgess turned down BYU then head coach Roger Reid told him that he was letting “the other 9 million members of the LDS Church down” (before he let millions of Duke fans down with his play during his two years there). When former Tennessee coach Bruce Pearl was fired in March there was plenty of speculation about where he would head next. While the logical choice seemed like a TV studio or announcing booth, it looks like Pearl wants to get back into coaching. With a NCAA show-cause penalty imminent Pearl would have to head to the NBA (former Oklahoma coach Kelvin Sampson’s hiring is a pretty clear indication that the NBA doesn’t care about breaking NCAA rules). It appears that the Texas Legends, the NBDL franchise for the Dallas Mavericks, are interested in hiring Pearl as a head coach. Pearl will meet with the team on Thursday in Dallas and reportedly has the job locked up if he wants it. Even though we will miss Pearl’s antics and his excellent coaching we have a feeling that this may be a sign that we won’t be seeing Pearl around college basketball any time soon. NCAA Sanctions: From a basketball perspective, the biggest story in the Big East this summer was up at UConn. The Huskies received a notice of allegations from the NCAA in May, informing them of eight major violations in the recruitment of Nate Miles. UConn will find out its final punishment from the NCAA in October, but the violations have already cost them two assistants — Beau Archibald and Brad Sellers, the son of former Husky star Rod Sellers. Jim Calhoun avoided the heavy artillery — getting grazed with a citation for “failure to monitor” the program, which is ironically what the best coaches need to do to succeed. Coaches: The NCAA infractions weren’t the only reason Calhoun was in the news. Ailing health as he nears 70, impending NCAA sanctions, a team that is going to need some rebuilding, and the fact his contract was up made many believe Calhoun would hang ’em up this summer. Wrong. He signed a five-year deal instead. Calhoun had far from the worst summer for coaches in the Big East. Rick Pitino let the world — and every single opposing student section — know about his 15-second tryst on a restaurant table with one Karen Sypher. Bob Huggins fell, a result of being in Vegas the medicine he took on an empty stomach making him light-headed, and broke seven ribs. Fred Hill was run out of Rutgers, in part because he lost it on the Pittsburgh baseball team’s coaching staff. Through all of that, perhaps the worst summer was had by Bobby Gonzalez, who lost his job at Seton Hall, had the entire episode come out in the New York Times, sued his former employer, was unable to receive credentials at the NBA Draft, and then find himself arrested for attempting to steal a $1,400 man-purse satchel. The three new coaches to the conference: Oliver Purnell left Clemson for DePaul; Mike Rice left Robert Morris to fill in for Hill at Rutgers; and Kevin Willard left Iona and took Gonzo’s spot at Seton Hall. LOIs: Three Big East teams made headlines for issues with recruits signing LOIs. DePaul initially refused to release Walter Pitchford, Jr., from his LOI. He signed with Jerry Wainwright, who was at DePaul before Purnell was tabbed. After appealing both the school and the NCAA, DePaul finally released Pitchford. The same thing is currently happening to Joseph Young at Providence, who as of this writing has not yet been granted a release by the Friars. At Marquette, DJ Newbill was dropped from his LOI when Buzz Williams had the opportunity to bring in former top 100 recruit Jamil Wilson, a transfer from Oregon. All in all, Big East members did not shine bright this summer. Back to Providence: Man oh man, did they have a rough summer. Two freshmen kicked out of school for beating up a student. Their star, Greedy Peterson, thrown off the team. Another player arrested. Did Keno Davis have this much trouble in mind when he took the job two years ago? Seton Hall Didn’t Fare Much Better: Aside from their coach being kicked to the curb, the Pirates had their best big man spend nearly a month in the hospital because he collapsed after finishing a workouts and saw Robert “Sticks” Mitchell get arrested for (get this) robbing eight people at gunpoint just two days after being kicked off the team. Villanova stumbled towards the finish line last season. 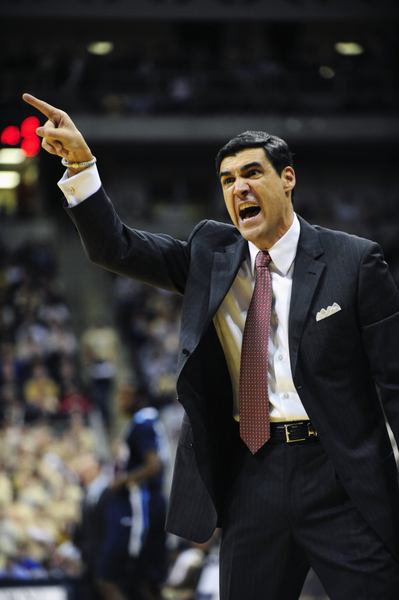 This year, Jay Wright’s troops are Rob Dauster’s favorites to take the Big East in 2010-11. Villanova: While the Wildcats lose All-American Scottie Reynolds, Jay Wright‘s club (as always) will be more than fine in the backcourt. Corey Fisher, fresh off an alleged 105-point performance in a Bronx summer league, and Maalik Wayns will be as dynamic as any backcourt in the country and should be able to thrive in Scottie’s absence. Corey Stokes is still going to be a lights out shooter. Dominic Cheek and James Bell will be dangerous on the wings. Up front, the five-man rotation of Antonio Pena, Mouph Yarou, Isaiah Armwood, Maurice Sutton, and JayVaughn Pinkston gives Villanova a very deep, very talented roster for the upcoming season. The Wildcats should compete for the Big East title and, depending on how well some players develop (Armwood, Cheek, Wayns, Yarou) and how good a couple of freshmen are (Bell, Pinkston), Nova could very well make a run at the Final Four. Pittsburgh: The Panthers were the surprise of the Big East last season, and with the majority of their roster coming back this season, its tough to envision Pitt falling off. Pitt has almost reached the level of a Wisconsin — no matter who is on their roster, this is a team that is disciplined and well-coached to the point that they are always going to be competitive. As always, expect a gritty, defensive-minded team from the Panthers. An already-solid back court of Ashton Gibbs, Brad Wanamaker, and Travon Woodall will be bolstered by the addition of freshmen Isaiah Epps, JJ Moore and Cameron Wright, as well as Lamar Patterson finally getting healthy. Gilbert Brown, who missed the first half of last season due to academic issues, will be back at the small forward spot. Brown had an inconsistent season in 2010, but showed flashes of some serious potential. Gary McGhee and Nasir Robinson will bolster the front line, but the real x-factor on this team is going to be sophomore Dante Taylor. Taylor was one of the most highly-touted recruits last year, but it took him awhile to adjust to the Big East. If Taylor can live up to his promise, Pitt is a potential Final Four team. If not, this is still a club that will be competing for a league title. Marquis Teague, the top-rated point guard and fourth-ranked player overall in the high school class of 2011, announced moments ago that he planned to attend Kentucky and play for John Calipari a couple of autumns from now. This news had been unofficially broken on Twitter yesterday by Teague’s friend Tony Wroten, Jr., another highly ranked (and still undecided) PG prospect in the class of 2011, so today’s announcement came as little surprise. This verbal gives Calipari his second top 5 prospect for 2011 in the last week. The top-ranked player in that class, 6’7 SF Michael Gilchrist, committed to Kentucky last Wednesday, the same day that big-time PG prospect Brandon Knight decided to bring his skills to Lexington for next season. As if that week weren’t good enough, at Saturday’s Jordan Brand Classic (so-called) in New York City, Doron Lamb, a 6’4 shooting guard ranked in the top 30 for 2010, also pledged to Kentucky. And the commitments — for both 2011 and 2010 — don’t look to be done, yet. Despite the lack of surprise, Teague’s verbal today is also noteworthy because of where he isn’t going. Hoop fans know all about Marquis’ brother Jeff Teague, the former star at Wake Forest and current Atlanta Hawk, but Teague’s father Shawn played for Rick Pitino at Boston University. 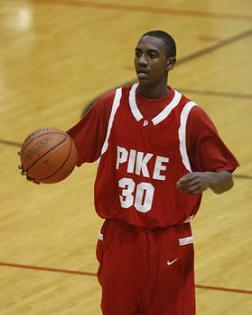 Like Jeff before him, Marquis stars for Pike High School in Indianapolis, not even a two hour drive from Louisville. The Cardinals could use a point guard now that Edgar Sosa’s gone. We’re not saying the two things are related or how much effect it ever really could have had, but as of late last season Pitino’s staff at Louisville includes a former assistant at Pike High School named Shabaka Lands, hired as “special assistant to the head coach.” It’s easy to see how badly Pitino wanted Teague, and with the Cardinals having only (as of now) one verbal commitment from a player within the ESPNU-100 — 6’5 SG Justin Coleman, from Huntington WV — and considering that Teague was at one time considered a virtual lock for Louisville, Cardinal supporters are worried that Teague’s verbal commitment today is an indicator of how highly-ranked high school prospects regard these two programs in the Bluegrass State. Rob Dauster of Ballin is a Habit is spending the week as the RTC correspondent at the Big East Tournament. In addition to live-blogging select games throughout the tournament, he will post a nightly diary with his thoughts on each day’s action. Here is his submission on the Second Round games. What is there to say about Georgetown that we don’t already know? This team is balanced, this team is poised, this team has size, they have shooting, they execute offensively, they are tough defensively. There is not anything this team cannot do… when they are playing well. The problem with that caveat is that they don’t always play well. So while they looked like a dark horse Final Four contender today, tomorrow they could come out and lose by 30 to Syracuse and I wouldn’t be surprised. The difference in this game, believe it or not, was Georgetown’s transition game. South Florida loves to attack the basket, be it via the post up, the drive,or the offensive rebound. As a result, the Bulls on far too many occasions got caught with too many players in and around the paint. Georgetown took advantage, getting some easy baskets in transition and a number of open looks in secondary break situations. South Florida didn’t hit their first three of the Big East tournament until there were 30 seconds left. And that was made by a walk-on. Tonight’s performance — five points from outside the paint and the foul line, only two prior to that final three — was only marginally better than yesterday. If you’re counting at home, South Florida had three baskets outside the paint in 80 minutes of basketball in MSG. Yeah, that’s not good. USF was playing for a chance to make the NCAA Tournament. Now they are headed to the NIT. You don’t want to play Marquette in the tournament. There is no team in the country that is more battle tested than this group. The most impressive part? Its so obvious how much they have grown. Winning is a learned skill, and Marquette has learned. Marquette is probably going to end up in the #7-#10 range somewhere. Whatever #1 or #2 seed gets them won’t be pleased. Buzz Williams is hilarious. First and foremost, his dances on the sideline are great. The one that left an impression with me today was the one-footed hop step with a leg kick on a three Marquette hit in the first half. In the presser he had some gems. And do I need to mention this is a short, pudgy man with a big head shaved bald? All around hilarious guy. 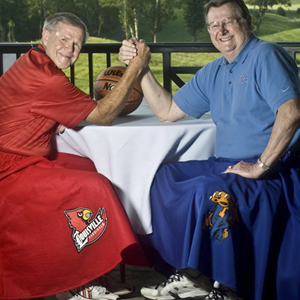 Personally, I see no way that St. John’s can fire Norm Roberts this year. I touched on it yesterday, but this is a team that returns ten — 10 — seniors next year. Buzz Williams mentioned it in the presser after the game, but its obvious to those who watch St. John’s, no coach in the Big East has his team play harder than Roberts does. St. John’s has been very close in a number of games this year as well. He deserves at least one more season. There is a good reason why Mack is so excited for this early game. With eight consecutive wins, Richmond has not only cracked the top 25, they have actually taken the lead in the A-10 standings. If the Spiders win their last three games against Xavier, Dayton, and Charlotte, their tournament stock could make a huge jump. The Musketeers have won four games in a row and are tied with the Spiders for the Atlantic Ten lead. Richmond comes in ranking only 90th in offensive efficiency, and they are going to have to hit their open shots, as they won’t get many second chance opportunities against the best rebounding team in the conference. 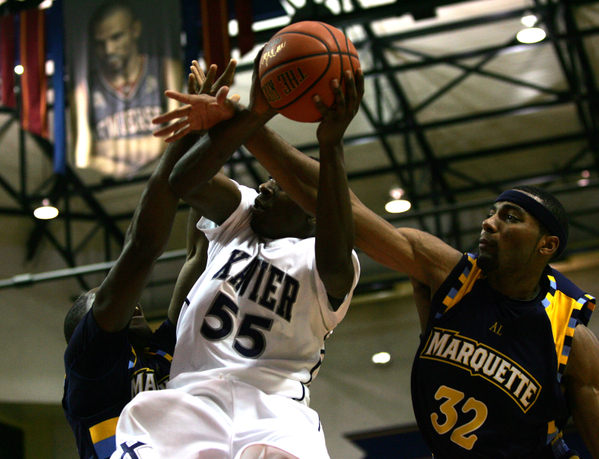 Xavier has a dynamic offense that ranks 10th in efficiency and features future NBA pick Jordan Crawford. Xavier has won 22 consecutive games at home, and if they are able to hold Kevin Anderson in check, it looks like Richmond may lose its place atop the A-10. Both of these teams were in trouble of missing the tournament a few weeks ago when they met up. Louisville survived that game, but with losses against St. John’s and Georgetown since then, their at-large status is still in doubt. UConn, due to two improbable wins over Villanova and West Virginia, is playing their way back in the tournament. RTC said before UL’s last game that they were going to have to get production from somebody other than Samardo Samuels and Edgar Sosa. The Cardinals only had four points from their bench in that game, so Louisville is still going to need some more balance if they are going to beat a hot team like Connecticut. The Huskies’ offense features four double figure scorers, but rank just 61st in offensive efficiency, largely due to a poor assists to turnover ratio. Louisville’s defense ranks just 68th in the country, and they have allowed their last five opponents to shoot over 40% from the field, which will not cut it at the XL Center. The Cardinals started the year just 1-6 on the road, but have won their last two road trips (including a win over Syracuse) so perhaps they have figured out what was plaguing them earlier in the season. With Connecticut ranked 40th in the RPI and Louisville at #41, this game could be the difference in who is among the last four in and who is among the first four out. Given UConn’s recent upsets, look for them to continue their surprising run toward a potential NCAA berth. #903. Philadelphia 76, Goldey-Beacom 65. It’s not D1, but we don’t really care. Anyone who wins 903 games deserves all the accolades he can get, and RTC is happy to oblige (especially when their fans oblige us with a well-deserved RTC). 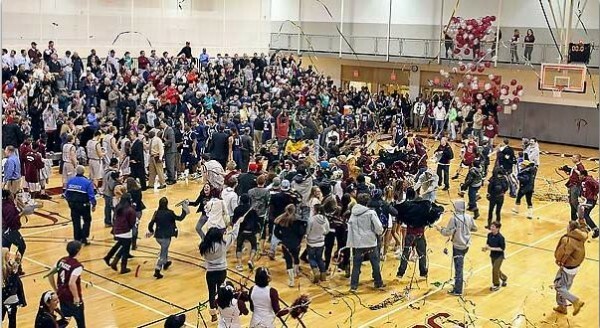 With local coaching luminaries such as Villanova’s Jay Wright and Temple’s Fran Dunphy in attendance, the 68-year old coach Herb Magee thrilled an SRO crowd by avenging the school’s only CACC conference loss as he officially became the all-time leader in NCAA wins, passing Bob Knight’s 902. His Rams move to 23-6 overall and 15-1 in the conference as they look to make another run in the Division II Tournament next month. Magee won a national title at the school in 1970 and has averaged over twenty victories a year ever since, yet he says he has no plans to slow down as long as he’s healthy, inviting everyone back in “four and a half years” for the next celebration at 1,000. After the game fans were given t-shirts with Magee’s name and the number 903 on the front — if anyone can send us one of these, we’d be exceptionally grateful. Congratulations, Coach Magee — a class act, through and through. The Wild and Wonderful Big East. #13 Georgetown 70, Louisville 60. As soon as you think you have this league figured out, it surprises you again. Come on, who wasn’t saying at halftime of this game tonight that the Cards were surging and the Hoyas were cooked. It’s ok, you don’t have to admit it to us, but that’s what we were thinking too. Um, we guess the Hoyas weren’t thinking that. Georgetown used a 24-5 run to start the second half and silence the Freedom Hall crowd behind Austin Freeman’s 29/4/4 assts, the vast majority of which came in that half. The rest of the game was academic, as Rick Pitino’s team fell back into its old habit of Edgar Sosa (24/8 assts) and Samardo Samuels (11/6) doing most of the shooting (and scoring). Both of these teams are now 9-6 and one game behind West Virginia for magical double-bye that the Big East Tournament offers its top four seeds. Georgetown has two winnable home games vs. Notre Dame and Cincy sandwiching a tough road game at WVU, while Louisville has three pretty tough games remaining (UConn and Marquette away, Syracuse at home). As for the long-term viability of these two teams, both have warts, but Georgetown’s better offensive balance and big-game ability carries a lot more weight with us — if having to choose now, Louisville looks like a first-round upset waiting to happen, while the Hoyas are a Sweet Sixteen team so long as their starters stay on the floor. Upset of the Night. Evansville 55, #24 Northern Iowa 54. How badly must suspended UNI center Jordan Eglseder feel now? Although the Panthers are still safely within the NCAA field even if they lose in Arch Madness next week, this loss to the hapless Evansville Purple Aces will have a serious impact on their seeding two Sundays from now. Evansville, who has won only two games in the MVC all season but beat the top two teams (UNI and Wichita State) on their home court, held Nothern Iowa to 33% shooting and only 5-27 from three, one of their three worst performances of the season. The few Evansville fans who were there actually RTC’d, but we haven’t yet found any photographic or video evidence of this yet. For how large the gap is between their rankings, Georgetown is not that much better of a team than Louisville. Georgetown is still aiming for a #3 seed in the Tournament, while Louisville still has some work to do. However, Louisville is a game ahead of the Hoyas in the Big East standings, and with a victory tonight they will have more wins on the year than Georgetown. UL has all the momentum, as they are coming off of three straight conference wins and the Hoyas have not won since February 9. Louisville’s main concern will be guarding the Hoyas, as the Cardinals’ #80-ranked defense will be going up against a Georgetown team that shoots 50% from the floor as a team. They Hoyas are trying to rebound from a rough performance against Syracuse in which they missed 40 shots and Julian Vaughn was held scoreless. The Cardinals have a solid offense as well, ranking ninth in offensive efficiency, but they are going to need more help from players other than Samardo Samuels and Edgar Sosa. Jerry Smith is their third leading scorer, but he hasn’t scored more than seven points in a game since February 6. The Hoyas have lost two straight games, but their second half performance against Syracuse may indicate that they have come out of their slump, and they should get back on track tonight. The Wildcats have quietly been working towards a potential #2 seed the last few weeks, winning their last five games against the bottom of the Big 12. Texas Tech, who has lost three straight games to most likely kill their at-large tournament hopes, is now among the worst teams in the conference. Had the Red Raiders pulled out their recent games against Oklahoma State and Texas, they would have looked like a much more formidable opponent at 18-8, so this game won’t likely be a blowout. Nevertheless, the Red Raiders are going to have to step up their defense if they want to keep this game close. Their defense, which ranks #97 in efficiency, has allowed their last four opponents to shoot over 40% from the field, including a road game against Baylor in which they allowed the Bears to make 55% of their shots. Kansas State, led by Jacob Pullen and Denis Clemente, features four legitimate scorers and ranks in the top 10 in offensive efficiency, so they will likely capitalize on any defensive miscues that Texas Tech makes. Although the Red Raiders don’t have the best offense by any stretch, they shoot almost 39% from the three-point line, and can at least keep the game within reach if they hit their shots. Against Baylor, they made 8 of their 13 three-pointers, so this game may largely hinge on their three-point shooting. KSU has a solid defense, and given that Texas Tech dropped their last two home games, I don’t think the home crowd will play much of a factor tonight. There are only a handful of teams that have a winning streak of at least five games, and two of them will meet in this clash that has huge Big Ten title implications. The Buckeyes will want to keep pace with the Spartans (and several other contenders) in order to claim at least a share of the conference championship. Both of these teams stand at 9-3 in the conference, but only Ohio State is ranked (#16). Illinois, if they win a third consecutive game over a ranked Big Ten team, will not only appear in next week’s top 25, they will also likely be considered the front-runner for the Big Ten title. In order to top Ohio State, Illinois is going to have to get past defensive standout David Lighty and a Buckeye defense that only gives up 60.5 points per game. Demetri McCamey has exploded for the Illini when they have needed him the most, shooting a combined 19-29 against Michigan State and Wisconsin. Although Illinois does not rank in the top 40 in either offensive or defensive efficiency, if McCamey can carry the team on his back again, they will certainly keep this game close. Ohio State’s offensive game is solid as well, as they are third in the nation in field goal percentage, and they rank eighth in offensive efficiency with four players averaging in double figures. Although the Buckeyes are hot, their wins have come against the basement of the conference, while Illinois has asserted itself as one of the most overachieving teams in the country, so look for the Illini to get the win to move one step closer to a Big Ten title. Although people are well aware of the struggles of North Carolina and Connecticut, Louisville has been just as big of a disappointment this season. Last year’s Big East winner and #1 NCAA tournament seed, the Cardinals are currently on Joe Lunardi’s first four out. UL is an acceptable seventh in the Big East, but if they continue to perform on the road like they have so far this season (1-6) they will not have to wait on Selection Sunday to know what their plans are for mid-late March. The main reason for Louisville’s disappointment is their inability to play defense, with an efficiency rating of #82 in the country. Syracuse not only ranks better on defense at seventh in the country (they rank in the top ten in steals and blocks per game), they are also among the nation’s best offensive teams. Syracuse averages 81.6 points per game, and ranks #11 in offensive efficiency with the best field goal percentage in the country. Louisville’s offense has struggled as of late, especially second-leading scorer Edgar Sosa, who is coming off a zero-point effort against St. John’s in which he went 0-6 from the field with five turnovers. To make matters worse for UL, Syracuse is heading in the opposite direction, as the Orange are third in the nation with eleven consecutive wins. Despite all the evidence to show why this game will not be close, the one thing the Cardinals have going for them is that there could potentially be a trap game for Syracuse. Their next game is on the road against Georgetown, while Louisville knows they need to win almost every game to make the tournament. Also, Wesley Johnson still does not appear to be 100 % back from his leg injury, as he is just 8-23 from the field in his last three games. Nevertheless, Syracuse is too talented not to win this game.